The best thing about tax-time? The refund. Such a joyous time, don't you think? When you hear the word, doesn’t it make your little heart go pitter-pat in sheer delight? Regardless of whether overpaying your taxes so you get a big refund is a good idea, for most self-employed people they probably aren't going to have a refund. Let's look at some ways to minimize what you'll have to pay, or maybe even get you into that refund territory. When you work from home, there are unique tax deductions you can take for doing so. The list grows if you are self-employed, but if you’re actually employed working from home, not only could you see your standard return (the one calculated based on how much was paid in from your regular employee paycheck), but you might also qualify from work at home deductions, making your return even greater. (S & E) In order to take this deduction, the space must be used exclusively for your business. Just because you lay in bed eight hours a day, plugging away at your blog, that doesn’t qualify your bedroom as you “principle place of business.” You don’t want to fudge on this deduction either, because the IRS looks really closely at this one. 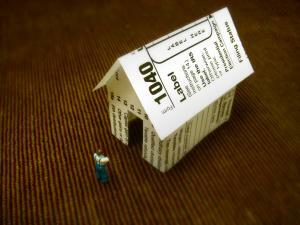 This deduction includes things such as utilities, maintenance, home depreciation, rent, and even property taxes. You can’t actually take the full amount of these things, only the respective percent of the portion of your home your office occupies. Note, too, that I included “E” on this one. Just be sure that your home is being used as a place of business for the ease of your employer, not you. (S) This means things like postage and shipping costs. This counts if you have any solely business-related subscriptions or memberships (to places like iFreelance or eLance, for example). You may also deduct for software and equipment you use exclusively for your business as well. This does not include things that you normally keep in your home office. For instance, if you aren’t using your paper solely for your business, or the scotch tape, they are not tax deductible. Any work at home deduction must be for something used exclusively for your business. Common business expenses in the equipment realm are fax machines, scanners, and copiers. Do not deduct your computer if it is not used solely for your business. If your husband plays games on it, or your children do all their homework on it, it is a home computer, not a business computer. I’m not going to include S or E here, because it is entirely dependent upon the retirement plan. However, if you are self-employed and take advantage of a SEP (self-employed qualified retirement plan) or a Keogh plan, don’t forget that your contributions are not taxed. (S & E) If you use a form of paid childcare while you are working (again, only while you are a working), that portion of your childcare expenses is tax deductible. Keep good records here, though, because you can’t take a deduction for the times you simply hired a babysitter because you wanted to go see the latest Johnny Depp movie. (S) These are absolutely 100% deductible if you are self-employed. Of course, you can’t take more of a deduction than your net profit. In other words, the government isn’t going to send you an extra paycheck for $200 if you only made $1000 net profit from your business, but had to pay $1200 out in insurance premiums. Bummer, I know. (S) This really falls more under the original home office deduction, but I figured I would mention it. If you have a second telephone line used exclusively for your business, or if you had heating and air conditioning put in to the backyard shed/guest house that you turned into your home office, you can deduct those utility costs. (S & E) You’ll have to check the fine print in your tax book to see what this year’s mileage rate is, but if you have to travel or commute for your business (past a certain mileage), you can deduct that mileage. This helps pay for the wear and tear on your vehicle and helps with fuel costs. This deduction is separated into business, charity, moving, and medical miles. Each one has different deduction rate. For business miles driven, the 2010 tax deduction is $0.50 (which is down from 2009, by the way). In addition to mileage, travel expenses also include things such as meals and hotel costs. Keep good records if you plan on using this one. (S) This is primarily for those who are self-employed, but I suppose there may be some exceptions, depending on the circumstance, and who benefits from the P.O. Box. If you do not want your business to be linked to your home address, you can deduct the P.O. Box you’ll use in place of it. Again, a P.O. Box is only deductible if it is used exclusively for your business. Okay, so did I miss anything? You’ve pretty much deducted your whole life by now. Oh, don’t forget to deduct the cost of the tax and accounting software you use to get this all filed. Which reminds me, you can also deduct the filing fees you use to maintain your business license. Some commonly overlooked deductions also include your website, advertising, and marketing expenses. We are not tax professionals, so you should seek their counsel before making any decisions. This is simply a guide to help you get started. Happy tax season, everyone! Great post! While I don't work from home now I do plan to have a small business of some sort when I retire (AND my partner works from home now so I am going to pass this info along to him). Thanks! I'm glad you found the post useful, Jane. I think planning on supplementing your retirement with a small business is a great idea. :) Thanks for passing along the post.